Connecting the receiver and cord to the pocket hearing aid ? Insert the L ? shaped plug on one end of the cord into the receiver socket.The other end of the cord has a flat plug.Insert this flat plug in the receiver.Press receiver against the adopter & snap them together.Now the ear adopter is ready for connection. 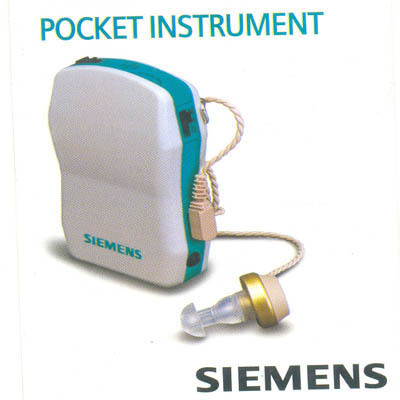 Pocket Hearing Aid Siemens - With easy to operate volume control dial,the desired volume can be set from position 1 (minimum) to position 4 (maximum). Always use dry cloth to clean your pocket hearing aid siemens. WARRENTY - 1 year if any manufacturing defect * .